Titan, Saturn's largest moon, described as a "weirdly Earth-like place"
It is well known that Earth is unique as the only planet in the solar system which can sustain life. However, in other respects, Earth may not be quite as unusually as is often thought. 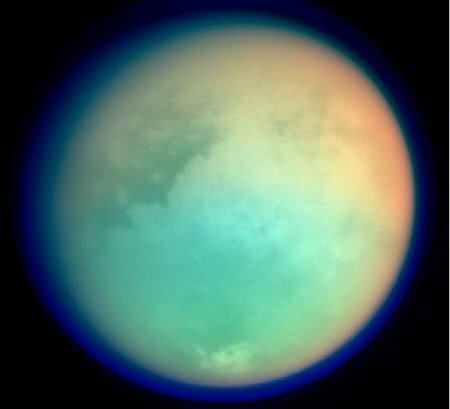 Astronomers studying Titan, Saturn’s largest moon, have described it as “a weirdly Earth-like place” when it comes to geology. Titan boasts landscapes shaped by the flow of rivers – though they are rivers of liquid methane, not of water. And, like Earth, the surface of Titan is surprisingly free of craters, implying that geological activity is constantly reshaping the moon, as also happens here. The icy landscape of Titan was first discovered by Earth-bound researchers in 2004, when the Cassini-Huygens spacecraft which orbits Saturn first broke through the moon’s atmosphere. Scientists had previously been unable to see the amazing rivers which carve out channels in the moon’s surface, as its atmosphere is so thick with methane and nitrogen that the landscape is not visible from Earth. Intrigued by the discovery of the methane rivers, researchers from MIT and the University of Tennessee at Knoxville wanted to investigate the history of Titan’s geology. However, despite the visible river networks, the astronomers found less erosion than they had expected, given that Titan has been orbiting Saturn for four billion years. Similarly, when they looked for craters which could have been caused by meteorites, there were far fewer than on most other moons in the solar system. In fact, the number of craters was more reminiscent to the situation on Earth, where plate tectonics and volcanic explosions have covered up much of the impact of foreign bodies on the planet. “Earth’s continents are always eroding or being covered with sediment,” said Taylor Perron, assistant professor of geology at MIT. Discovering which factors were responsible for shaping Titan’s landscape could be a challenge, as the satellite images do not give a good impression of the ups and downs of the moon’s terrain. “It’s almost like we were thrown back a few centuries, before there were many topographic maps, and we only had maps showing where the rivers are,” Taylor Perron added. Despite the challenges, Taylor Perron said he expected the similarities between Titan and Earth would give scientists an ongoing insight into how the moon’s surface has changed over millennia. “It’s a weirdly Earth-like place, even with this exotic combination of materials and temperatures. Johnny Depp and Vanessa Paradis reconciliation?